All-new Naim Uniti: hi-fi streaming fit for the future | What Hi-Fi? Naim is synonymous with bleeding-edge audio technology – and rightly so. The hi-fi company has been thrilling audiophiles for over 40 years with its forward-thinking separates and integrated music systems, which it has designed, engineered and hand-built at its Salisbury base since the early ’70s. It has always questioned, always innovated and above all, always strived to deliver a pure music experience as close as possible to the original live source: just as it’s supposed to be heard. That’s why, eight years after the original Naim Uniti redefined what a one-box hi-fi system could do, Naim went back to the drawing board to completely reinvent the Uniti line-up. And in doing so, it’s made Uniti arguably the most future-proof – and most jaw-droppingly desirable – music platform money can buy. Why ‘music platform’? Because the genius of Uniti isn’t just in its ability to play pretty much any format of music. It’s in the fact that the underpinnings shared across the range mean Uniti devices can work together to form a seamless, home-wide music system with truly unassailable hi-fi credentials. In reinventing Uniti, Naim has not done things by halves. There is not one new Uniti all-in-one player, but three: the entry-level Uniti Atom, the CD player-equipped Uniti Star and the reference-quality Uniti Nova. 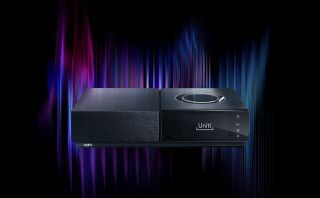 These complement the Uniti Core, a hard disk-based CD ripper and UPnP audio server specifically engineered to feed music to up to 12 Uniti all-in-one players. The first new Uniti all-in-one player out of the gates is Uniti Atom. Despite being the ‘starter system’, it’s really a concentration of the remarkable versatility and impressive engineering available across the range. The brain of every Uniti all-in-one player is a powerful, custom-built streaming platform, compatible with legacy Uniti and Mu-so wireless music systems but equally ready for the future, with support for all the standards you need to get your music off your device, network or wider web: Apple AirPlay, Chromecast Built-in, UPnPTM, Bluetooth aptX HD and vTuner internet radio, as well as built-in Spotify Connect and TIDAL support. As with every device in the new Uniti range, though, Uniti Atom is not simply a ‘client’: plug in a tune-packed USB hard drive, and it’ll play and serve them to up to four further Uniti or Naim Mu-so devices on your network. All can be controlled via the revamped Naim app for iOS or Android, which lets you access all of your music, including your favourite radio stations, streaming services and playlists, and explore artist discographies and biographies. It even lets you update your Uniti system wirelessly with a single tap. Naim’s remarkable attention to detail extends to how new Uniti speaks to other devices. All new Uniti systems feature state-of-the-art 2.4 and 5GHz 802.11 b/g/n/ac Wi-Fi, and a patent-pending reflector behind their Wi-Fi aerials that’s designed to increase range and improve sound quality. Wired connections are equally well catered for. Analogue sources can be hooked up via RCA, while optical and coaxial inputs handle your digital kit. All new is support for HDMI ARC, which means you can use Uniti Atom to bolster your home cinema system, too. All that is the easy bit, though – it doesn’t matter where an audio device gets its music from if it doesn’t sound any good once it hits the speakers. Uniti’s 4th Generation, 40-bit SHARC DSP processor is capable of executing 2.7 billion instructions per second, which means huge lossless files of up to 32-bit/384kHz (WAV) are handled with all the ease of MP3s. This processor removes timing errors before feeding Naim’s RAM buffer with audio data, which is then oversampled 16 times before being fed into the Burr-Brown DACs. A rigorous process, all in the name of creating a smooth and precise sonic performance. All the weight of Naim’s 43 years of hi-fi heritage is brought to bear in the Uniti Atom’s 40W Class A/B amplifier, which borrows technology from the brand’s iconic NAIT range of integrated amplifiers. (The Uniti Star has 70W, and Uniti Nova 80W.) Across the range, the oversized, backlit volume control speaks of Uniti’s central purpose, but it’s not just about impactful looks: turns of the dial are sampled to a premium digital resolution, and a Bluetooth aerial lurks behind its shiny facade. Looks are important, though, and each Uniti’s new industrial design simultaneously recalls the glory days of hi-fi while affirming its status as next-generation streaming hardware. As with the Uniti Star and Uniti Nova, Uniti Atom’s hand-crafted, brushed aluminium chassis is inlaid with a highly polished, five-inch, full-colour glass screen, making it easier to navigate device menus, and giving album art real pop. The best bit? Each device also has a proximity sensor, waking the screen as you approach. Finally, to give another example of Naim’s appetite for progress, consider Uniti’s remote. Rather than infrared, which requires line-of-sight, it uses Zigbee wireless technology to speak to your Uniti system, and its white backlights illuminate in harmony with the Uniti player, making it a truly intrinsic part of the system. It’s really par for the course for Naim. Always questioning, always innovating, always producing hi-fi that’s ahead of its time – and always in the service of exceptional-sounding music. >> To find out more about the new Naim Uniti range, click here.